I pride myself on being a Colorado mountain woman. Three days in the Alaska wilderness cured me of that notion. It was perhaps the most relaxing, enjoyable, remote three days of my life. I took a float plane into otherwise inaccessible Caribou Lodge. They allow a maximum of eight guests, but to my delight, I was just one of three. Three nights to look forward to what Joe and Bonnie could create entirely off the grid in this wilderness wonderland. I read (on my carefully-managed battery-powered iPad). I hiked, kayaked, “glassed” for hours and hours for wildlife. I was rewarded with naps, a caribou siting, gasp-provoking views, and a sense of peace like no other. I’d hike to the top of Bear Hill and long to be even farther out, more alone. It was incredible. And through it all I was incredibly conscious of food, shelter, water, and power. The joy of my trip was created by my ability to dress warmly, retreat to shelter, enjoy water traveling to pipes from the spring, and the recharging ability of both solar pads and a generator. My entrance and exit was allowed by an aviation-fuel propelled float plane. Throughout my life I have flirted with off-the-grid phases inspired by some combination of desire for self-sufficiency, romance for a low impact life, and fear of the zombie apocalypse. The lessons are always stark. Fifteen-years of heating with wood required chain saws (fueled by gas) and wood splitters (powered by electric), caused massive particulate pollution, and ultimately led to a string of family respiratory illnesses. The composting toilet just… well… was gross. And so on and so forth. I took great comfort when I read Farewell my Subaru, ironically provided by a work colleague who was probably laughing at my travails. In this great book, the author finds that living remotely and naturally requires an awful lot of resources and the support of a manufacturing-driven village. Which made me thankful for both my remote Alaska wilderness trip, and the resources which make it possible. My two guides and other guests shared many interesting conversations about the real tradeoffs of environmental enjoyment and protection. Without invoking clichés, we covered abundant environmental ground from hunting and trapping, through wildfires and rain, to water and outhouses. We shared a love for the literal ground we were hiking while discussing the resources required and constraints inherent in a remote and rural lifestyle. We know that dense urban dwelling provides the smallest environmental footprint. Ironically, life in the remote Alaska bush is probably more energy intensive than in an urban flat. Certainly my travels to the bush were incredibly costly in terms of fuel and resources expended. Yet I left more enamored and committed to wilderness and my engagement with it than ever before. 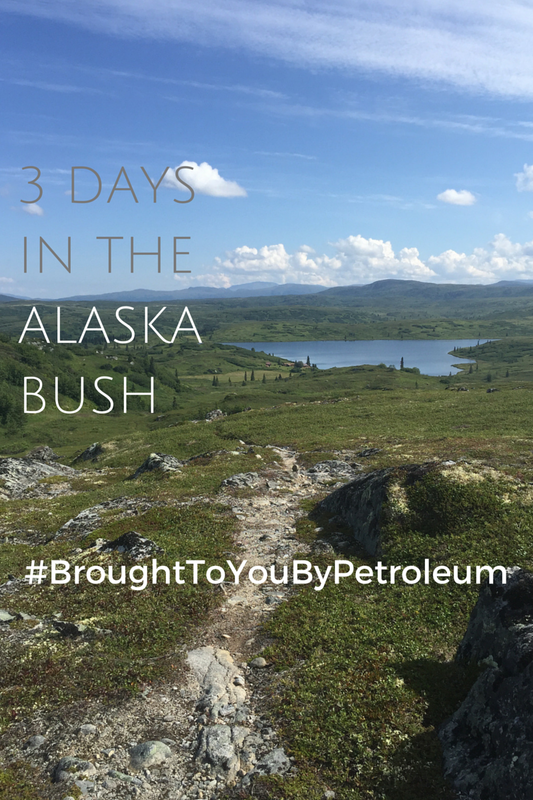 I am amazed at how much my solitary, rural retreat was #BroughtToMeByPetroleum. I’m grateful to have both wild solitude and abundant petroleum resources. Enjoyed your blog post, we loved having you out here at Caribou Lodge. We hope to see you again soon!